I was born in 1957 in Oudtshoorn and am currently living on a grape farm in the Porterville area where I'm working as an assistant to the financial director. I've studied art for 3 years in Grabouw under the watchful eyes of Alta van Zyl, the well-known Overberg landscape artist. 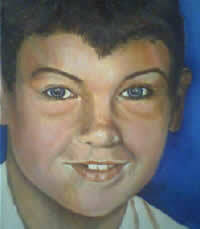 Since beginning of 2006 an art student at the Art School Land van Waveren in Tulbagh. 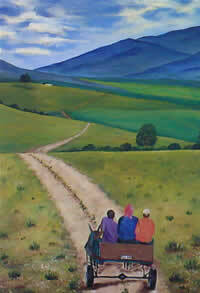 Exhibited as part of a group in Bredasdorp, Somerset West (2002) and Tulbagh (2006). Currently some of my paintings are on permanent display at Paddagang Restaurant and Danie Theron Guest House in Tulbagh (as part of a group display: Art School Land van Waveren). 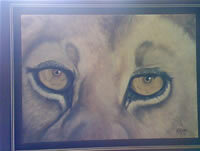 I work mainly in oils and acrylics. 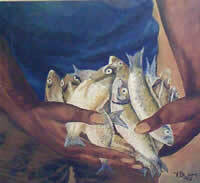 Detail is very important to me and is reflected in my paintings. I am fascinated by certain parts of the human body, i.e. hands, faces (especially young children) and feet. The rolling clouds and masjestic mountains of the Western Cape also inspire me. Other hobbies: singing and playing the guitar. Married with three daughters.